Bacon is having a moment in the spotlight, having migrated from the breakfast plate to the dessert course. The one thing that bacon does really well is act as a flavoring. The smokey, saltiness can be added to a lot of dishes without including the actual meat – not that you couldn’t, of course. Now that the spring greens are starting to appear, bacon can be the bridge between winter and spring. A classic salad dressing is oil with vinegar and other flavorings. Rather than oil, warm bacon fat can be used, creating a rich dressing that pairs well with apples, tomatoes and greens – anything else that would go well with bacon. To begin, cook some bacon. The recipe below creates more fat than is strictly needed, but don’t discard the extra. Bacon fat can be rubbed on potatoes prior to roasting, or used in place of butter or oil in cornbread. Pretty much anywhere you would want a little smokiness. In the past, I’ve recommended that bacon be cooked in the oven. That will still work, but pouring hot bacon fat off a baking tray is more excitement than I like to deal with in the kitchen; so a regular frying pan will work fine. Be sure the pan is hot prior to adding the bacon. Bacon in a cold pan will steam while waiting for the heat to rise. You’ll eventually get the fat you need, but you’ll end up with soggy bacon in the meantime. When the bacon is crispy, remove it to a paper towel to drain, pour off any extra fat, then saute the shallots, if using. The shallots should be soft and golden brown. Add the vinegar and mustard, then whisk everything together. If you are a fan of dressings that are more tart, stop here. If you like them a bit more sweet, add in the honey. 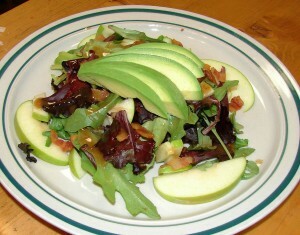 Honey and bacon is one of my favorite flavor combinations, especially over a crisp green apple. Once everything is whisked together, pour the results into a small container. This dressing is fantastic warm, but it’s also quite good after sitting overnight. The salad pictured is made up of mixed greens, a sliced green apple, a bit of crumbled bacon and topped with an avocado – which also goes very well with bacon. This would also work with a warm potato salad or poured over seared scallops. Because it’s a dressing, nothing is written in stone. Feel free to adjust the amounts – or even the ingredients – to your taste buds. If it tastes right to you, then it probably is. 2. Let the bacon cool down a little bit, and then in the same pan you cooked the bacon (and which still holds the liquid bacon fat) add in the vinegar and the mustard (and the shallots if using) and whisk it all together, scraping up the browned bits from the pan and adding in salt to taste. 3. Depending on the fattiness of the bacon, you may need to add more vinegar – it’s a question of balance and a question of preference, I tend to like my vinaigrette a little on the tart side, and so I often find myself adding in more. Friend Us For Advanced Food Knowledge! Home | About KDG Cooks | Catering Events Big or Small | Welcome!